Today was less than stellar. I thought I was doing well to be heading to work on time, early even, and then I realized I forgot to do something on Saturday and had to do it before I went to work. (It was work-related, at least.) As I was doing that, I realized I had forgotten something else I was supposed to do (work-related) and it was due at 9. It was 8:40 a.m. at this point. And from there, my day just continued to get worse. Lucky for me, my friend Mai is in Asheville this week and we had a sewing date for tonight. 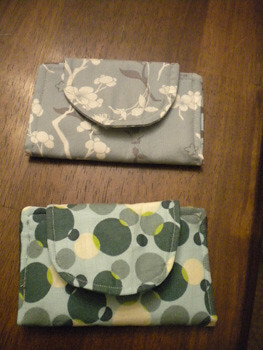 I bought a business card holder at LAAFF last month, and we wanted to duplicate the pattern. And we totally did it. 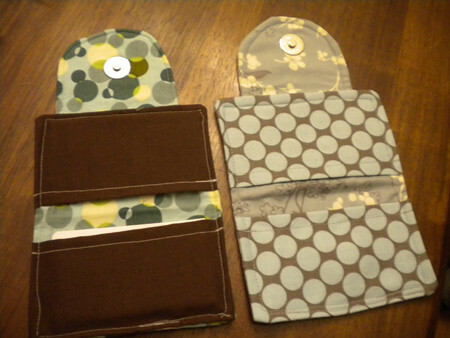 It only took a few minutes to figure out the measurements, and then about two hours (from cutting to the final stitching) to put the card holder together. I learned that neither of us is great at top-stitching. And in those two hours, I totally forgot about my workday. Pretty great, right? Especially without a pattern. Tomorrow has to be better than today. At least, I hope it is. I have to wait on the city to show up and inspect our furnace. Oh yeah, I totally didn’t put the appointment into my phone and missed them last Friday. So maybe my bad Monday started on Friday afternoon when I saw the “failure” notice they left for us? No, really. Tomorrow is going to be better. those are really cute! You totally ended the day on a great note!